Fishing doesn’t happen as often as I would like these days, So I always like to have different rod and reel combos set up ready for when the time comes I don’t have to waste time setting my gear up. I have 5 different set ups that I use, some more than others, but they all have their respective uses. No. 1. An ultra lite setup, a short one piece rod around 4’6 with lite action, spooled with braid on a small spin reel. I use it for flicking soft plastics or small spinning lures, and it’s size is good for when you need to keep it in the boat to avoid catching it on low branches when traveling to a spot in the river. No. 2. A medium ugly stik, 6 foot long heavy action rod, an open faced reel spooled with about 65 pound braid, used where there is a lot of structure like sticks, logs and rocks, and good sized fish that are likely to grab the bait and head straight for the structure to cut me off. Being a heavy action rod with braid that size, allows me to put the hurt on a big fish and drag it out of the structure, before it can cut the line. No. 3. Is a 7 foot medium/ heavy action Abu Garcia rod that has a fast tip action, this makes it great for jigging, using a live bait, or fishing with lures where more sensitivity is required to feel what is going on at the other end of the line. It is a well-balanced rod and reel combo, which makes casting distance and with accuracy easy to achieve. No. 4. Is a 7-foot medium to heavy action rod, with bait-caster reel which is ideal for trolling out on the lake or up the river. No. 5. This is a heavy duty deep sea fishing combo with a heavy overhead reel, the line guides have rollers and it is spooled with 100 pound line, I use it trolling with big live baits or heavy skirted lures, when I am looking for that big catch of a lifetime. I would say that for the majority of my river fishing, I use my number 1 rod, the ultra light combo, and my number 2 rod, the 6 foot Ugly Stik. These 2 rods cover the majority of situations and the other 3 are good for out on the lake or in open water, chasing bigger fish. 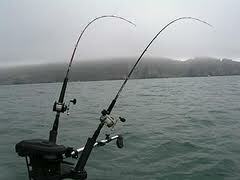 With these 5 different fishing rods setup I’m always ready to go as soon as the fish come on! One of the best experiences in the world on a perfectly clear morning, just as the sun begins to sneak above the horizon, is heading out to sea. The boat seems to glide over a silky smooth surface of the water, just as the red glow of the sun begins to light up the sky. We are heading out to our favourite couple of marks about 6 mile out to sea at a depth of around 36 fathoms, our weapons of choice for today are Daiwa rods, and big fish is what we are hoping to find. As we head out I decide to hang a couple of X-rap lures out the back to see if we could stir up a few Mackerel or yellow fin tuna as we cross several smaller reef sections on the way to our main mark. The silver bodied X-rap lure would have to be my favorite of the Rapala lures I use, as I always seem to get plenty of attention when I use it, it has a couple of teeth marks down the side from some earlier near misses. 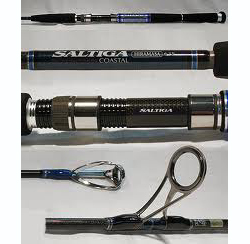 The Daiwa Rods I have on board for trolling are the Saltiga G Boat rods, the matchup of quality parts on these rods gives them greater strength and lifting power to be able to control powerful fish. Daiwa rod’s and big fish are a perfect match up! It’s time to get the gear sorted for when we hit our mark, so I’m ready to drop the bottom bashing gear as soon as we drift on to the fish. The deck hand calls out to the skipper that were on, and he slows the boat top allow us to start winding in the catch, it feels relatively tiny and there is no definite head shakes, like you get from a good sized Mackerel or Wahoo, as I wind to the leader I catch a flash of silvery blue which is a sure sign it’s only a Mac Tuna from a small school we probably drove past as they fed on the smaller bait fish on the surface. 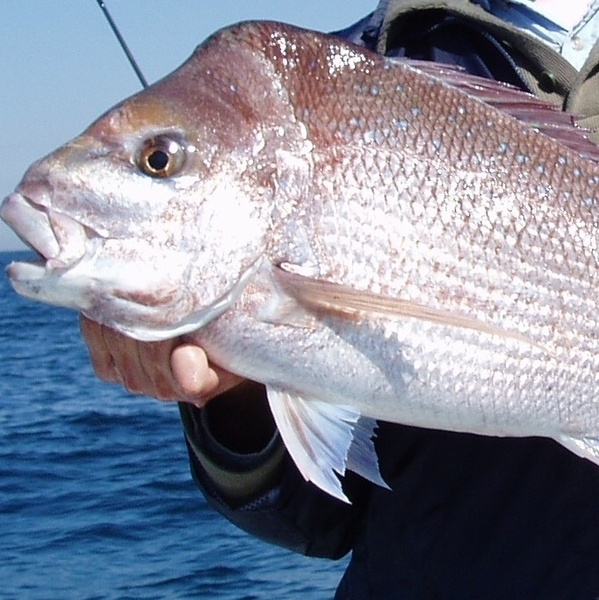 Not a very good eating fish but works well as strip bait for snapper and kingfish, nothing better than bait this fresh so we’ll put them in the ice for later. Skipper sets us back on course and we let our lures out the back for another try for some better eating fish this time. You can start to see a light ruffle on the surface of the ocean now as a light south easterly wind picks up, the forecast is pretty good for the rest of the week, so I’m sure a little bit of breeze on no more than a meter of swell is going to bother us too much today. We are nearly on our marks now so we wind in the trolling gear as the skipper starts to have a look around on the sounder for a decent patch of fish, he is pretty sure he has a spot so we get organized for our first drop. I’m integrating another Daiwa Saltiga rod with one of Daiwa’s Saltiga lever drag 2 speed fishing reels . If you are chasing big fish like we are today you need a reel like this one, that will handle serious strength braided line, as well as mono in certain circumstances. Skipper positions us and we drop our lines in all set to drift over our first mark. The reason I use Daiwa gear is I know that when I get hooked up onto some big fish that my equipment is not going to let me down. You want to have the confidence and power from your gear if you run into a good school of kingfish and you need the capacity to haul it up fast to avoid it dragging your line into the reef and cutting you off. Having poor quality gear is not something I like taking chances with in situations like that. I’ll fill you in on what happens in the next post but for now if you want more information on the Fishing tackle I use click the link. In the Summer months when the sea is alive with action, there is nothing I love more than having a troll around for a few yellow fin tuna using one of my trusty Daiwa rods and rapala lures. I find that if I target tuna then I will usually catch just about anything else that is around as well using the same setup. When it comes to trolling for any pelagic species your eyes are your best asset. You need to look around for signs of action, like chopping water, birds diving and even visible current line changes. If your not lucky enough to have the budget to afford top of the line sounders and radar gear that can do some of that for you, then you need to learn to read what you can see with the naked eye. Any time I’m fishing and even more importantly when I am miles out to sea, I need to know that the gear I am using is not going to let me down because it is a long way home to grab a spare if something goes wrong. That is why I switched almost all of my rods over to Daiwa Rods some time ago and haven’t looked back since. Daiwa Rods are built to handle the toughest situations and are setup to allow the angler to have maximum strength when needed to take control of even the biggest fish. When it comes to Fishing With Lures, some people put way too much thought into picking which lure they think the fish are going to go for today, and I have found that it doesn’t make a huge deal of difference. I have heard people say that you should pick a bright colored lure on a cloudy day and a dull one on a sunny day, but no one has yet been able to prove to me why this has any merit. I personally have a couple of favorite lures I may switch between if nothing seems to be striking but I usually find that if one lure doesn’t work the other probably won’t either. When targeting fish like tuna I will always use a skirted lure that produces a good stream of bubbles behind it when towed at the correct speed. Most lures work well when traveling around 7 knots, so keep an eye on your speed. When you spot an area that looks like it may be what you are after, try to slowly work around the outside of it rather than driving straight through the middle. If you find a patch of fish you don’t want to split them up or scare them off by barging straight in amongst them. Both Daiwa rods I use I have set up with good quality overhead reels to compliment the rod and I have one set up with braid and the other with mono-filament. I have mostly used mono for many years but are starting to experiment more with braid and so far are liking the results. I’ll keep you informed if I ever decide to use one or the other more in coming posts. I have put together a 30sec video of some of the range of Daiwa Rods Here! Proper Cleaning of your Daiwa Rods and Reels Is Essential! 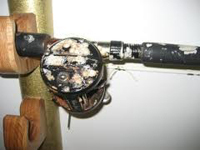 Salt Water is enemy number one when it comes to your fishing gear, in a very short period of time, salt water can corrode and damage your expensive fishing equipment, rendering it useless or unreliable. A small amount of cleaning and maintenace can make all the difference to how long your gear will last. Every time you return from a fishing trip you should take these steps to ensure long trouble free fishing each and every time. First thing is to thoroughly wash your rod and reel down with luke warm soapy water using a soft cloth or sponge, ensuring you concentrate on all the nooks and crannies that salt water and salt spray can get into. For general maintenance of the working parts of the rod and reel you should lighly spray a coating of WD-40 or similar protectant. Lighly spray on the reel gears, handle, guides and runners wiping away any excess or over spray using a soft cloth or paper towel. Wherever possible keep your rods and reels in a dry warm place out of direct sunlight. If you have spent as much on your fishing gear as I have then a lockable cupboard is a wise investment. I have heard too may horror stories of fishing gear going missing from a garage or other unsecure area. 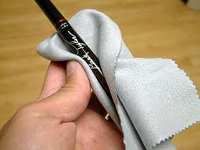 Just by following these simple cleaning and maintenance methods, you can keep your Daiwa Rods and reels in top shape for trouble free fishing each and every time.